With summer just around the corner, you may be thinking of ways to better utilize your outdoor space. Why not draw inspiration from our clients in Fairfax. After completing their kitchen and bathroom remodel they asked us to move the project outside. 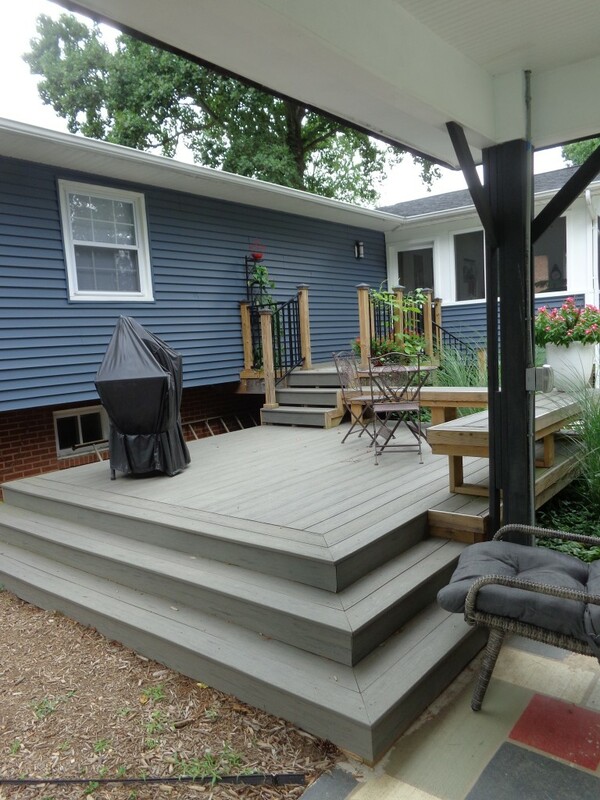 First we installed a new multi-level Trex deck with space to eat and cook all summer long. The built-in wrap around bench provides extra seating for large family gatherings. And with composite decking you never need to worry about sanding, staining or painting. We then poured the oversize concrete patio. 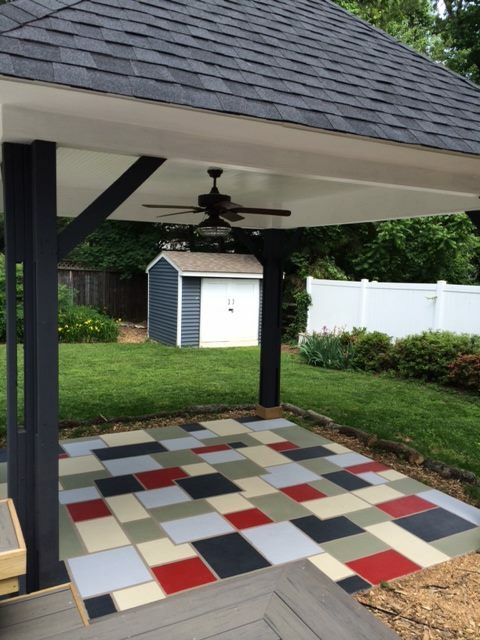 With its neutral color and scoring detail, the patio is as beautiful as it is versatile. Surrounded by well-placed native grasses, ivy and flowering plants, the look is complete. An outdoor living space should reflect your style, and compliment the architecture of your home. Some features are simple and cozy, while others like gazebos or patio coverings will require professional planning and construction. A well-executed backyard makeover provides not only a great space for entertaining on warm summer nights but can also add value to your home. Or as we like to say at Thomas Custom Builders, a win-win! Emma and I want to take this opportunity to thank you for help us realize our dream for our updated kitchen. We cannot be happier with the end result and the hard work that went into the final product. From the beginning conceptual design to finished product, it felt more like a partnership than an owner-contractor relationship. I never submit reviews online, but my family had such a great experience with Thomas Custom Builders that I wanted to share it. The design and outcome itself is excellent, but the experience working together was as noteworthy. I’d recommend this team to anyone. I would certainly recommend them to others, and have done so. If you are contemplating home renovations, Thomas Custom Builders is absolutely the professional team you want for the project – guaranteed! There’s an unmistakable dedication to values and courtesy that you just don’t seem to find anymore — these folks have it by the truck load. Rick and his team were exceptional to work with from the initial design and concept through final delivery. We were thrilled with his attention to detail and the value that we got for our money. TCB did a complete kitchen remodel for me and were a pleasure to work with. They treat their clients courteously and professionally while providing the know-how to help you achieve your project on time and on budget. I highly recommend them. 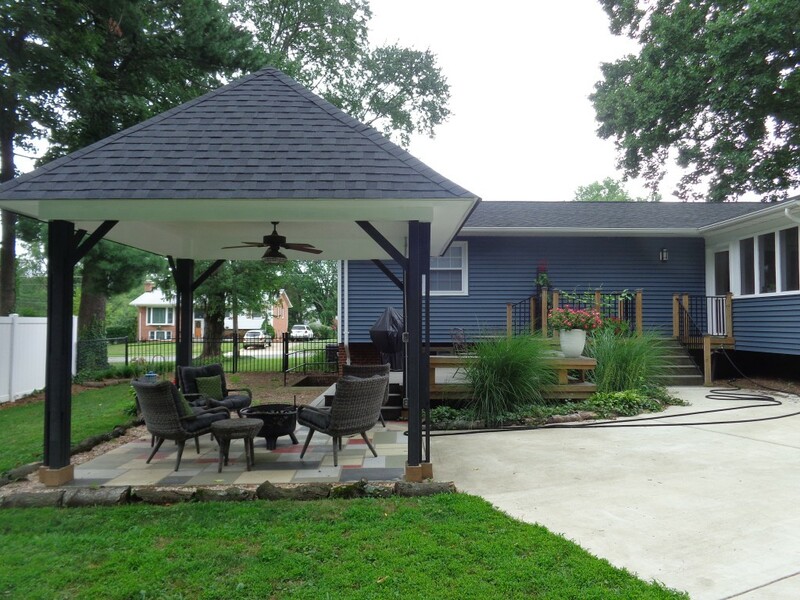 Thanks… We LOVE our new kitchen, windows, shower, lights, closets, electrical system, roof, eaves, gutters… AND our new deck! We are extremely pleased with the quality of their work, their integrity and their professionalism. On top of that, they are just nice guys! You will not go wrong with Thomas Custom Builders. Copyright © Thomas Custom Builders. All Rights Reserved. Website by Focus 4 Digital Marketing.